The Rams are moving to Los Angeles. 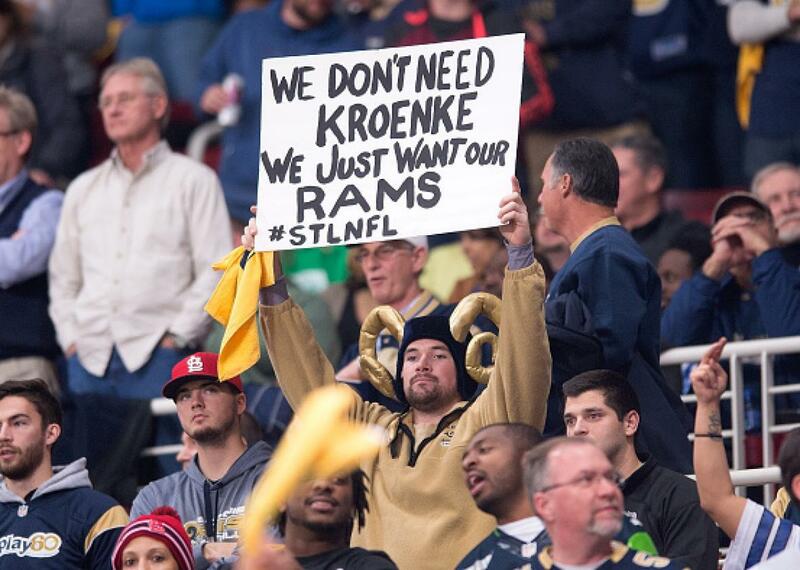 A fan displays a sign in support of keeping the St. Louis Rams in St. Louis during the final home game of the season against the Tampa Bay Buccaneers at the Edward Jones Dome on Dec. 17, 2015, in St. Louis. Update 8:50 p.m. ET: In the end, the St. Louis Rams are going to be going back to Los Angeles. The Los Angeles Times reported that the team would be moving to Inglewood, California, after a 30–2 vote by the NFL owners—a vote that went against an earlier 5–1 vote to send the San Diego Chargers and Oakland Raiders to America’s second largest city by the league’s Los Angeles committee. The Times reported that the Chargers would be given an option to join the Rams in Inglewood, but that it was not yet determined what the team would do. They also reported that the stadium could end up costing upward of $3 billion. Original post: The Oakland Raiders and San Diego Chargers took one step closer to completing a move to Los Angeles for the 2016 NFL season on Tuesday, while the Rams bid to leave St. Louis for L.A. seemed to take a hit. The NFL’s committee on Los Angeles opportunities voted 5–1 in support of a plan by the Chargers and Raiders to build a $1.75 billion stadium in Carson, the Orange County Register reported. Kansas City’s Clark Hunt was the only no vote on the six-owner panel. The recommendation must now be voted upon by all 32 of the league’s owners—who are meeting in Houston on Tuesday and Wednesday to discuss the issue—with 24 votes required go ahead with any relocation. The Los Angeles Times reported that one member of the committee told the paper that the vote was “not at all an indicator” of how the final ballot would turn out, however. The Times had earlier reported that a league consensus was building around a counterproposal by Rams owner Stan Kroenke for a $1.86 billion stadium in Inglewood to be shared by St. Louis and the Chargers (that sources told the paper that the cost of the plan would exceed that estimate by quite some margin). In April, the City Council in Carson voted to approve what would be one of the most expensive stadium projects in history and effectively bypass a public vote on the issue, following the lead of Inglewood City Council for Kroenke’s plan. While preventing citizens from voting on the stadium plans, neither city made clear what public contributions might be going to the stadiums or associated infrastructure and land costs. The Carson proposal claimed that city tax dollars would not be used to pay for the stadium without actually saying how it would be financed. In May, the Times reported that Goldman Sachs had “crafted a complex public-private partnership to build the nation’s most expensive stadium” at the Carson site. That included the possibility for extensive tax breaks. “Goldman Sachs’ job is to use, if not disguise, every public funding tax shelter and loophole,” John Vrooman, a sports economist at Vanderbilt University, told the Times. It’s still unclear, though, which teams will officially end up in Los Angeles, at which site, and what the terms of any stadium deal for the public might look like. The Chargers balked at $350 million in public money for a new stadium in San Diego in August, while the Rams were not satisfied with about $400 million in public funding to build a new stadium in St. Louis. Oakland did not approve any public money to attempt to woo the Raiders to stay. NFL commissioner Roger Goodell said last week that the current facilities of all three teams were “unsatisfactory and inadequate” and the proposed solutions weren’t enough to keep the teams from moving. The Rams’ Kroenke is the league’s second-wealthiest owner with a reported net worth last year of $7.6 billion. The family fortune of Dean Spanos, who owns the Chargers, is reportedly worth $1.2 billion, including the stake in the Chargers. Forbes estimates the net worth of Raiders owner Mark Davis’ family at $1.7 billion. The headline has been updated to reflect developing news.